Many of you have been loving my cauliflower mac and cheese recipe. I know that was only a couple of weeks ago, but I JUST remembered the Super Bowl is coming up (as you can see, I excel at planning ahead). So I spent a day earlier this week furiously testing this vegan cauliflower queso recipe. 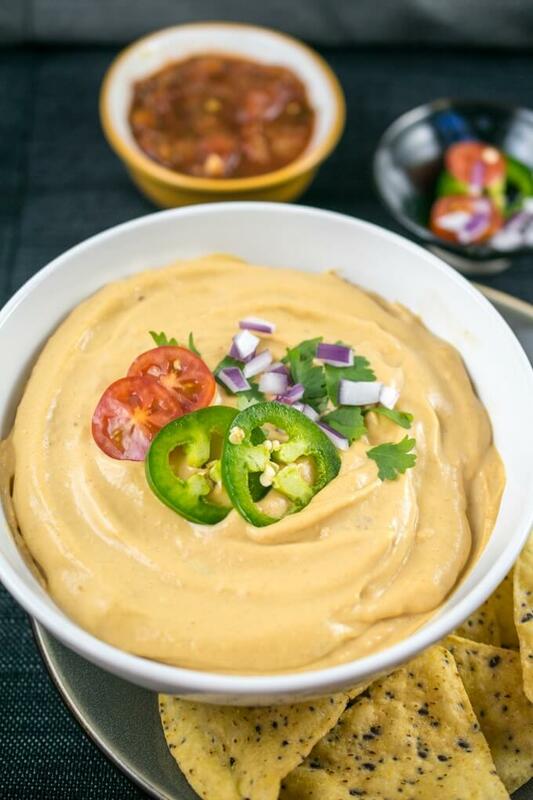 Made from silky smooth cauliflower and creamy cashews cooked with familiar nacho cheese flavors, this is my best vegan nacho cheese yet. As you may recall, I’ve never fully embraced the vegan potato carrot cheese because of the strange and sweet carrot flavor. Someone pointed out on my previous recipe that cauliflower has a slight sweetness to it too. (But importantly, still no weird carrot taste). I think that works fine for cheezy pasta but I wanted this cauliflower queso to be extra funky and tangy. So I tempered that mild sweet flavor with a fairly aggressive amount of pickled jalapeno juice and hot sauce. Not to worry – if you have kids or others with sensitive taste buds, you can swap in some vinegar for less heat. Anyway, I’ve seen many queso recipes call for Rotel. That’s cool too, but I kept things thematic and added a little bit of salsa to my cauliflower queso, as well as amping it up with sauteed onion, garlic and jalapeno. The rest of the jar of salsa went on my nachos (recipe coming soon… hopefully). Don’t have salsa? Tomato paste will do! There’s just a little bit of nutritional yeast and miso here for umami flavor too. 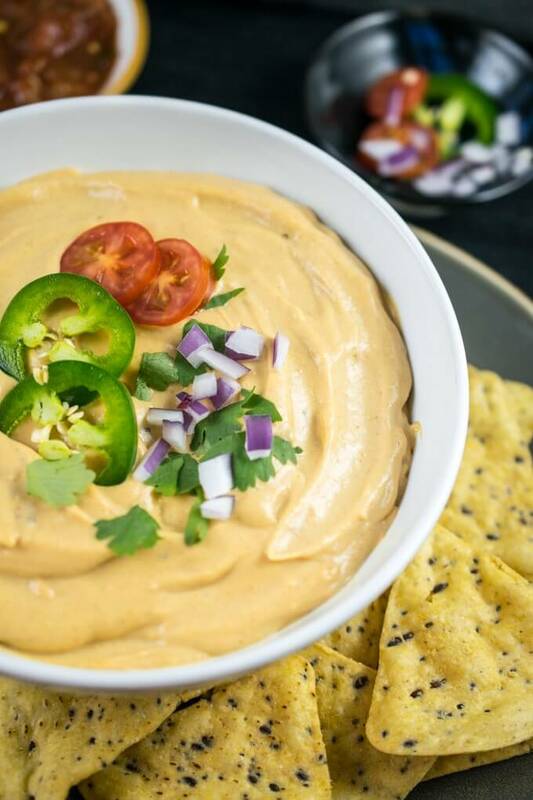 A few steps and dishes are needed to turn cauliflower and cashews into this delicious vegan queso dip, but I find with proper mise en place this recipe is actually quite easy! Something really delights me about not needing to mince the garlic. Thinly slicing it instead saves maybe 2 minutes of time, but judging by my emotions you’d think it was 30. While I was getting ready to publish this I found some old photos from 2015 when I was testing a disgusting sweet potato queso. I’m so happy that I discovered vegan nacho cheese made from cauliflower, as it’s unimaginably better looking and tasting than that old one. This recipe seriously, sort of, almost, slightly tastes like dairy based nacho cheese that I used to eat a long time ago :). You can use it as a dip, or thin it out a little bit more and drizzle it on nachos, in burritos, and more. I know folks will ask if this vegan cauliflower queso can be made in the Instant Pot or another pressure cooker. I haven’t gotten around to testing this yet but I imagine that 5 minutes under pressure would do the trick, so you can perhaps reduce the total cooking time of this recipe from 30 minutes to 20 once you factor in reaching pressure and the natural release time. Again – *not tested*. Let me know if you do this! 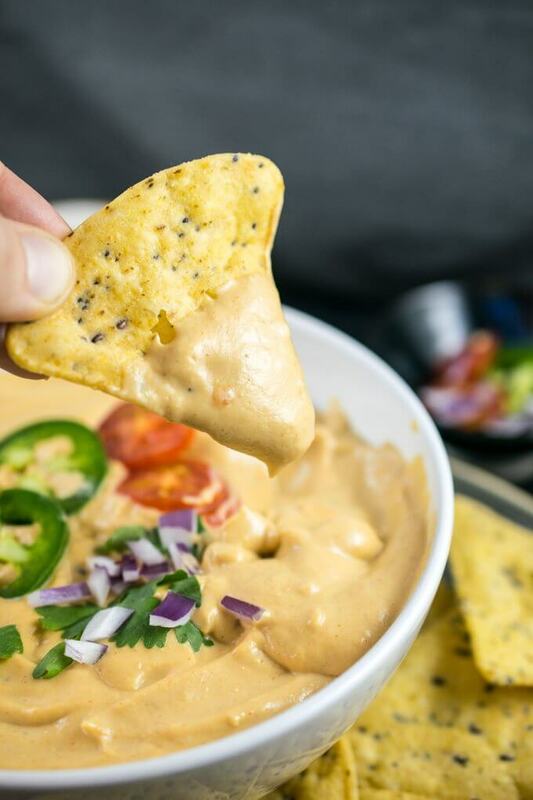 You'd never know that this dairy-free cauliflower queso dip is made with veggies! 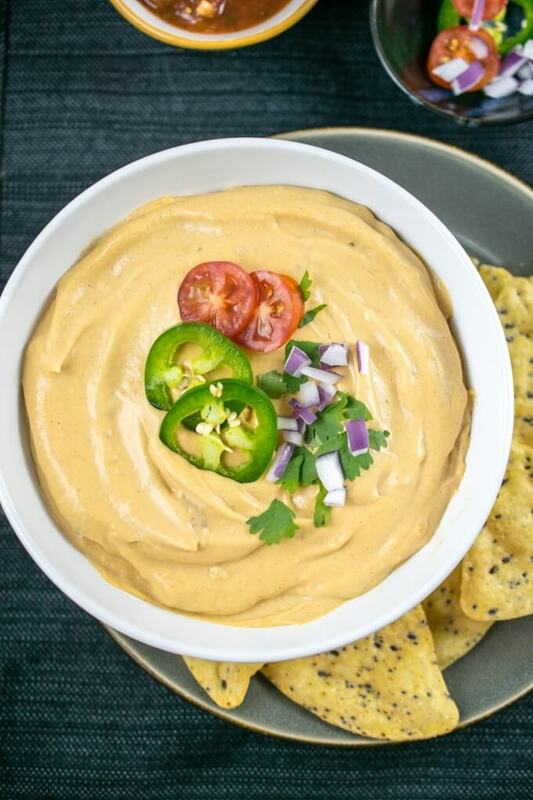 Creamy cashews and non-dairy milk make the base for this spicy, savory, funky nacho cheese-style plant-based dip. 4 cups raw cauliflower florets 14 oz. Heat the oils in a large saucepan over medium heat until shimmering. Add the garlic, jalapeno and onion. Cook, stirring occasionally, until softened, 3-5 minutes. Meanwhile, measure everything for the seasoning mixture into a small bowl and set aside. Add the seasoning mixture. Cook, stirring, until fragrant and starting to sizzle, 45 to 60 seconds. Add the non-dairy milk, scraping the bottom of the pan as you stir it in. Bring to a steady simmer. Add the miso, cauliflower, and cashews to the pan, reduce the heat to medium-low, and partially cover the pan. Continue to cook, stirring occasionally, until the cauliflower is fork-tender, about 20 minutes. Transfer the mixture to your blender (working in batches if needed). Add the jalapeno pickling liquid and hot sauce, and blend until completely smooth. If you don't have a high-powered blender this may take a few minutes to break down the cashews. Stop to scrape down the sides as needed. Rinse out the saucepan and return the blended cauliflower queso to your pan over low heat. Stir in the additional 2 tbsp of salsa, and add other seasonings (more jalapeno juice, hot sauce, salsa, or salt) to taste. You can also add a little more non-dairy milk to thin out the mixture now, depending on how you will be using it. Serve hot. Best served fresh, but leftovers keep well; the cauliflower queso will thicken more after cooling so you may need to thin it out with some added liquid when reheating. REDUCED SPICINESS: Here are my recommendations for updates if you don't want this to have a kick. Add 3 tbsp of sliced bell pepper to the saute mixture. Reduce the jalapeno pickling liquid to 1 tbsp and add 1 tbsp of distilled white vinegar. Adjust other seasoning to taste. SOY-FREE / PALEO: Use chickpea miso or another non-soy-based miso. Or for strictly paleo, omit the miso, increase the nutritional yeast by 1 tbsp, and add 1 tbsp fresh lemon juice. NON-DAIRY MILK: Plain soymilk is my most recommended for this recipe. Plain almond milk also works. Oat milk is not recommended due to its natural sweetness. Nulla dignissim tortor nec ante semper, vel vehicula tortor condimentum. Etiam luctus justo a turpis pulvinar semper. Vestibulum ante ipsum primis in faucibus orci luctus et ultrices posuere cubilia. Aliquam erat ac ipsum. Integer aliquam purus. Quisque lorem tortor luctus justo. Donec neque libero, maximus ut risus sit amet, rhoncus vestibulum purus. Sed dapibus elit rhoncus dolor tempus sodales. Vestibulum at euismod nisi. Nunc tortor augue, tempus sed lorem nec. Maecenas consequat, augue a venenatis risus. Ut id mollis vel, lacinia quam.